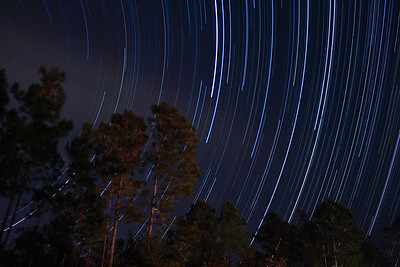 October in Florida marks the beginning of "Star Trail Season" as I like to call it. During the cooler months, the air is clearer and there are generally fewer clouds in the sky at night. Looking up into the night sky is always amazing, but to me it's even more amazing when you can use photography to see it in a reality that spans more than just one moment. I made this image early on the morning of October 24, 2012 in my backyard over an almost 6-hour period, looking toward Polaris in the north as the Waxing Gibbous moon was setting in the west. 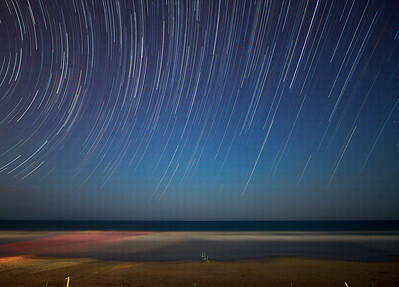 Roughly 75 minutes worth of star trails, over Daytona Beach, Florida, between 4:30 am and 5:45 am. More Backyard Star Trails on 01/08/2010. This is a combination of 281 30-second exposures, from 9:48 pm until 12:23 am. 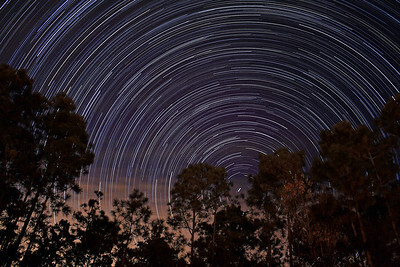 If you are interested in photographing star trails yourself, check out our article, How to Photograph Star Trails! Star Trails at Jax Beach on 2/1/2009. This is 18 minutes worth of exposures. That's all I could do before I got bored (and cold!) 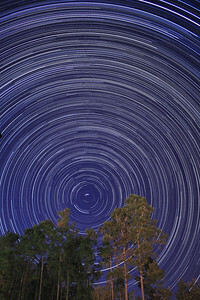 If you are interested in photographing star trails yourself, check out our article, How to Photograph Star Trails! Star Trails in our backyard on 11/21/2008. This is a combination of 490 30-second exposures, from 8:36 pm until 1:06 am. 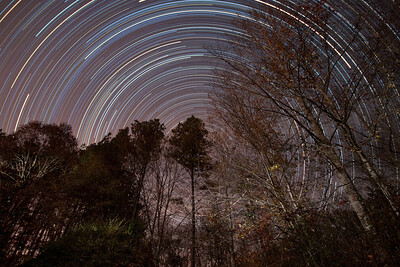 If you are interested in photographing star trails yourself, check out our article, How to Photograph Star Trails! Star Trails in our backyard on 12/02/2008. 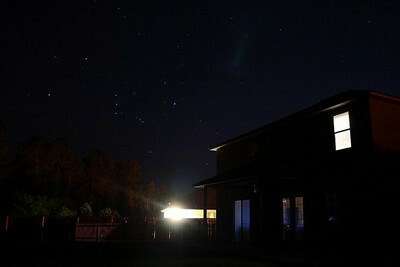 This is a combination of 471 30-second exposures, from 9:05 pm until 2:25 am. 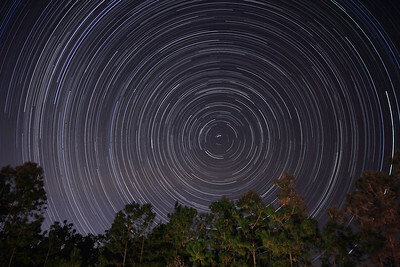 If you are interested in photographing star trails yourself, check out our article, How to Photograph Star Trails! 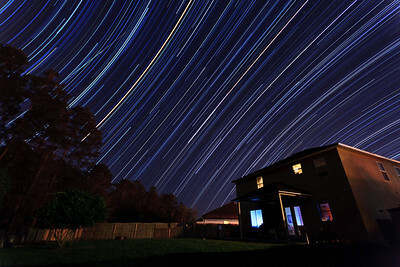 Star Trails in our backyard on 11/27/2008. 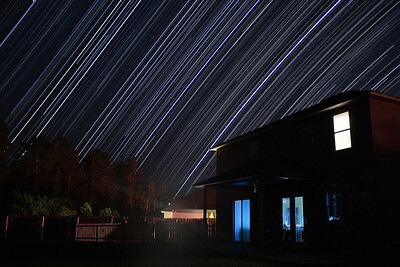 This is a combination of 441 30-second exposures, from 9:59 pm until 2:03 am. 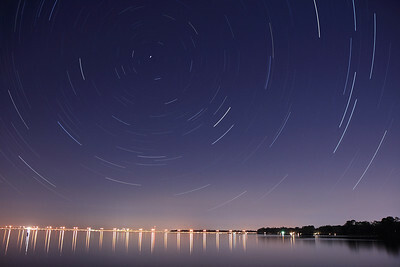 If you are interested in photographing star trails yourself, check out our article, How to Photograph Star Trails! 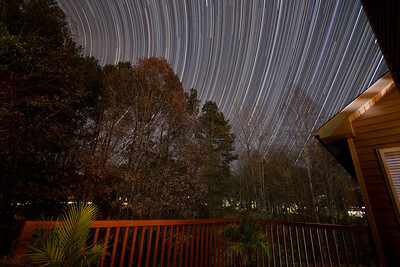 Star Trails in our backyard on 11/25/2008. This is a combination of 495 30-second exposures, from 9:21 pm until 1:54 am. 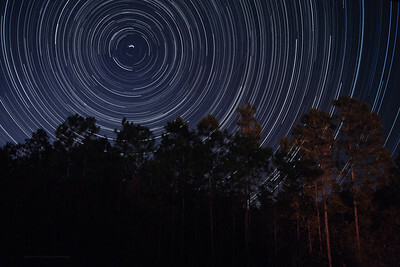 If you are interested in photographing star trails yourself, check out our article, How to Photograph Star Trails! 02/07/2009 Star Trails over the Buckman Bridge; roughly 1 hour......that's Downtown Jacksonville about a third of the way over from the left. 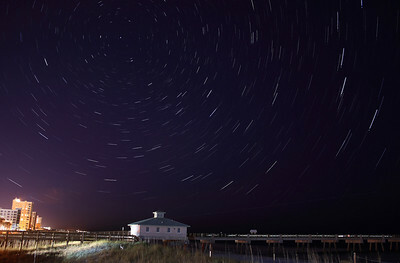 If you are interested in photographing star trails yourself, check out our article, How to Photograph Star Trails! Star Trails in our backyard on 11/23/2008. This is a combination of 428 30-second exposures, from 8:51 pm until 12:46 am. 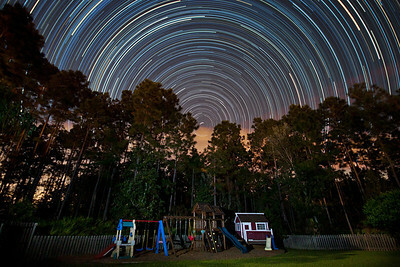 If you are interested in photographing star trails yourself, check out our article, How to Photograph Star Trails! Star Trails in our backyard on 11/21/2008. This time lapse video is a combination of 490 30-second exposures, from 8:36 pm until 1:06 am, combined into a 40-second video.